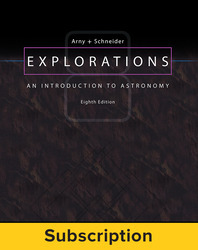 The 6-year subscription to Explorations includes access to Connect®, our digital assignment and assessment platform, a SmartBook adaptive eBook, an online lab manual, and a downloadable eBook. Steve Schneider became interested in astronomy at the amateur level when he was a child. He studied astronomy as an undergraduate at Harvard and obtained his Ph.D. from Cornell. His dissertation work received the Trumpler Award of the Astronomical Society of the Pacific, and he was named a Presidential Young Investigator. In addition to teaching introductory astronomy, he works closely with science teachers, presenting workshops and special courses. He also loves to draw and paint.